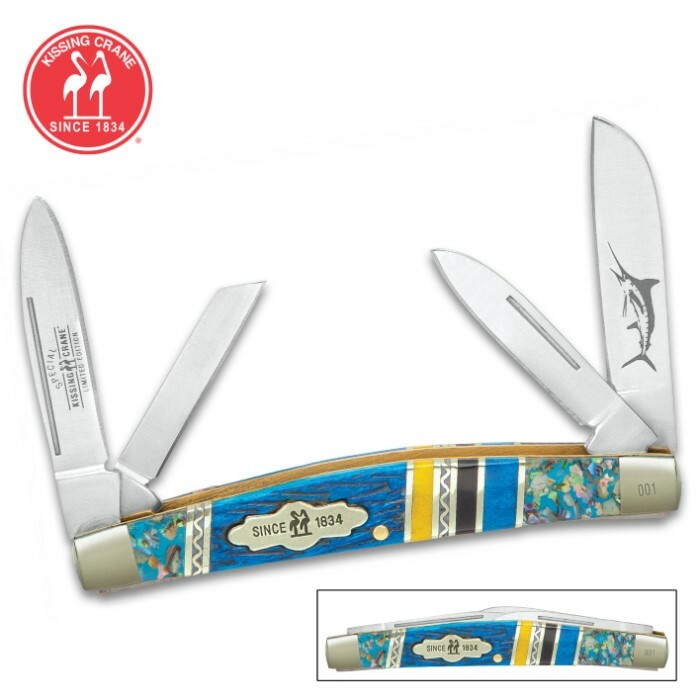 Kissing Crane Bahama Blue Congress Pocket Knife | BUDK.com - Knives & Swords At The Lowest Prices! There's nothing like going to the Bahamas so Kissing Crane pays tribute to these beautiful islands with its Bahama Blue Congress Pocket Knife. It features razor sharp 440 stainless steel blades with a sword fish etched on one of the blades and a handsome genuine aqua blue jigged bone handle. Polished brass bolsters, pins and accents and the classic Kissing Crane cast shield complete this exquisite design.